I received an e-ARC from NetGalley to review. Penelope Ruiz-Kar is tired. She’s working 50 some hours a week, the sole bread-winner for her family while her husband pursues a freelance writing career that isn’t taking off. She has two great kids she loves, but it sure would be nice if son Miles would stop wetting the bed each night, if only so Penny could sleep through the night. She’s coping, but just, when her best friend, Jenny, dies. Jenny’s death makes Penny start to question her life and she decides that things need to change. Instead of biting her tongue and avoiding conflict, it’s time for honesty. But Penny quickly discovers that honesty can be pretty scary, both when you’re the one giving it and when you’re receiving it. I loved this book. The characters were so real, and the situations they faced so true to life. There’s plenty of humor and heart along the way too. A great read that left me beaming. Molly and Liza are best friends – have been since elementary school. But over the years they’ve drifted apart. Molly’s married, with two kids. Liza’s still single, and has moved away from Cincinnati to Chicago. They schedule a video chat, a girls’ night, in a bid to reconnect. To Liza’s horror, as she waits for Molly to return to the room, she sees a man all in black slip into her friend’s house. She calls out to him, telling him she’ll call the police, and he closes the laptop Molly was using. 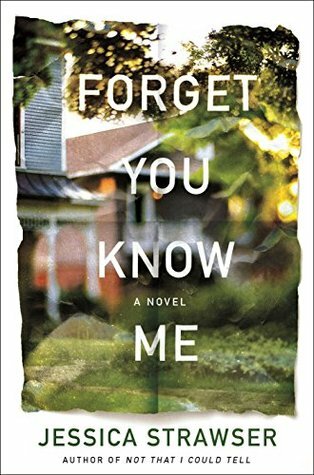 This is the intriguing start to Forget You Know Me. As the story unfolds we try to figure out if this was a random intruder, or if he was tied to something going on in either Molly’s life, or her husband, Daniel’s. Whoever it was, the intruder serves as a catalyst, forcing Molly and Daniel to reexamine their marriage and prompting Liza to make some changes in her life as well. The story definitely kept me guessing and I was eager to find out more about what was going on. Molly, Daniel, and Liza were realistic, if not always super likeable, characters. The ending was a bit unsettling, though not unrealistic. All in all a good read – definitely one that will keep readers hooked from start to finish! Well, I was planning to keep up with this blog better, but life happened. It’s been a busy month! I accepted a full-time position with the library. It meant transferring to a different branch. I’ve been in that position for 2 weeks now and there’s a lot to like: a consistent schedule that doesn’t include closings or weekends; a little more authority; nice co-workers; and a boss who doesn’t mind if I come in earlier than scheduled and then leave earlier. I don’t enjoy the longer drive, or the fact that it involves going through two roundabouts and crossing a bunch of railroad tracks (I got stuck by a pair of trains during my first week). I miss my regular customers from the other branch, and I miss having readers as customers (dvds are the thing that gets checked out the most at the branch where I’m at). And I’m really tired of having to put materials in the bug zapper on a regular basis. That was not an issue at the branch where I worked before but it definitely is at this one. (Did you know that bed bugs are a big problem for libraries? A library system in a nearby city zaps EVERYTHING returned because it’s so pervasive there.) But this position being full-time means I can finish out the 10 years of service needed to get vested in PERF (I was at 9 years and 1 month when I left the university), and having a slightly larger paycheck is good. The dogs have adapted to the change in routine well. The fact that my work schedule is consistent definitely helps with that. My husband took them up to the vet’s office yesterday to get their toenails trimmed and our vet told him we should write a book on the proper care of dachshunds because our girls are in such good shape. That was very nice of him to say. I certainly don’t think we can take full credit. I think we won the genetic lottery with these pups. They are both wearing their ages well. My weight-loss has been going great. I am down to 155 as of this morning (from 177.6 starting back on September 17th). I was originally planning to get down to 140 but honestly, I am happy with how I’m looking and feeling these days. I think 150 is a more realistic goal and so I’m making that adjustment. I have five more pounds to go so it’s time to add a few more carbs in. I will continue to gradually step up carbs to find the point at which I can maintain both a healthy weight and feeling good. One fringe benefit of this is that my husband is now thinking about his eating. He’s ready to quit drinking pop as well. I’m really proud of him for that. He has a far greater caffeine dependence than I do and I know he’s going to have a rough time dropping his morning Sunkist and the Pepsi he likes to drink with meals. We’re working on finding alternatives for him. He doesn’t share my love for coffee but he does like some teas so he’s thinking of trying hot tea in the mornings. We hunted all over town for the Bigelow Raspberry Royale that he likes best and none of the stores had it. We finally tracked it down on Amazon last night. I also found a sweetener I like, called Swerve. It’s a sugar alcohol (erythritol) and it’s the only sweetener I’ve ever tried that actually does taste like sugar. I don’t use a lot of it because I’ve gradually lost a good deal of my sweet tooth, but I still can’t do coffee without something sweet in it (a half-teaspoon of Swerve is just right for me). He’s tried it too and thought it was fine, so now he has something to sweeten his tea with other than sugar. I had a lot of fun with Funko’s Photo-a-Day challenge on Instagram. The POP collection continues to grow and I suspect I’ll find a few under the Christmas tree to add in (as will hubby). I’m trying to hit my Goodreads goal of 225 books for the year (one behind schedule at the moment) and vowing to do a better job of reviewing titles from NetGalley and other sources next year. The Goodreads goal will have to go down next year since I’m working full-time again, so I’m thinking about what number would be realistic. I want a challenge but not an insurmountable one. I think that’s the news. I hope all of you are enjoying your Decembers and looking forward to 2019! I hit the half-way point on my weight loss journey this week – 18.8 pounds lost, 18.8 more to go. I think I’m going to have to dig into the back of the closet to find some smaller sized pants before too long. People’s reactions when you say you’re eating low-carb are always interesting. I get a lot of skepticism. My favorites are the “didn’t Dr. Atkins die from a heart-attack (with the implication being it was due to his diet)?” or “so all you eat is meat?” questions. In fact, Dr. Atkins fell on ice and hit his head – his heart was just fine. In fact, the Atkins diet calls for eating a lot of vegetables. In induction, for example, you are restricted to 20 grams of net carbs (grams of carbs – grams of fiber) per day and 12-15 of those are supposed to come from vegetables. It’s funny to me how many misconceptions are still out there, and sad to see how pervasive the myth of dietary fat being bad for us continues to be. Thanksgiving is still a challenge. I feel like my choices are be the Grinch Who Stole Thanksgiving or give in and eat badly. I’m trying to figure out if we can modify some of the recipes to make a low-carb version without ruining the flavor. The funny thing is, my husband hasn’t been following the new way of eating but just as a result of eating dinners that are low-carb (the one meal a day we have together) he has lost about 5 pounds. I keep hoping he’ll be inspired and join me. I’d like to see him healthier, but I know he has to want that for himself first. In the meantime, I will just keep doing the best I can and hope he is inspired by the example. It has been a ridiculously long time since I’ve updated this blog. Lots has happened since then. My last post talked about my dog, Maggie, having IVDD. She made a complete recovery and zips around just fine; in fact, last time we were at the vet I mentioned that she was 13 and the vet tech was stunned. She doesn’t seem that old, and at every exam our vet comments on how she’s showing no signs of aging, save a little cloudiness in her eyes. I also left my job at the University. Nine years of a toxic work environment took it’s toll on me – issues with my neck and shoulders (from tension), heart burn, a bout with shingles, and finally chronic migraines. I gave my notice and left, with no other offer lined up. That was scary. But the heart-burn is gone and the migraines are mostly resolved. They still happen, but it’s more like once a month now instead of once a week or more. I am working part-time these days, which is both a blessing and a curse. I have more free time, which is lovely. The lack of income, on the other hand, is difficult. The changing schedule let’s me schedule other activities without having to use PTO, which is great, but the varying schedule makes setting up a regular exercise routine challenging. I’d love to get something full-time there, but so far I’ve struck out. I’ve changed my way of eating and am eating a low-carb diet these days. So far it’s allowed me to lose over 17 pounds in 7 1/2 weeks. My running is going better, with less pain in my bum shin (not having as much weight landing on that bone is good). I feel better, with more consistent, steady energy-levels instead of the ups and downs that sugars cause. I miss a few things, like pasta and potatoes, but I’m confident that once I hit my goal weight I can add those things in from time to time without ill effect. They just need to be a sometimes food rather than a regular food. The one thing that’s not going well is my writing. I’m not sure I can call it writer’s block – I have plenty of ideas, but I have trouble sticking with any of them to finish a draft. I blamed it on stress from the university job but it’s been almost 18 months since I left that place and there’s been no improvement. I was doing NaNoWriMo and I started strong but now I’m nearly 7000 words in the hole and unsure if I can climb out of that deficit. I also know the week of Thanksgiving will prove difficult for finding writing time. I’m scheduled for 9 1/2 hour days so that I can fit all my hours into 3 days. I meant to build up a cushion for those days, but again, I’m not sure how doable that is now. Thanksgiving is an issue in our house. I am trying to stick to my new way of eating, but my husband wants to have all the usual Thanksgiving foods – sausage stuffing, cranberry salad, green bean casserole. None of those are things I can eat if I stay on plan (he has not joined me in the new way of eating). The other issue is we wouldn’t eat them just for the one meal. All those recipes make a ton of food and we usually eat left-overs for 2 or 3 days after the holiday. I’m not sure what to do. I don’t want to ruin his Thanksgiving, but I also don’t want to ruin my healthier life-style. I’ve done well resisting temptation, despite the break room at work constantly being filled with sugary snacks, but having all those dishes in my house would be trying as they’re all things I love too. It’s quite the dilemma. My friend Jama posts a #HappyDayMoment every day to her Facebook page. She’s done so for over 2300 days to date. I don’t think it’s a coincidence that she’s one of the most positive, up-beat people I’ve ever had the privilege to know. This year I knew I wanted to be more positive. I wanted to find the silver lining more and complain less. On January 1st, I started posting a HappyDayMoment each day to my Facebook. Some days I struggled to find something to share that I felt good about. Some days I forgot until after I was in bed and had to grab my phone to get one posted. A few days I forgot until the next morning and wound up posting a belated one (I’ve remedied this by putting an alarm on my phone to remind me). But I’ve kept going – I’m into the 150s now – and I feel like I’m starting to feel a change in myself. Back on May 7th (only a month ago but it feels so much longer than that) I ran the Indy Mini. I signed up because it was a bucket-list sort of race, the kind of experience that would be one-of-a-kind. I was excited and, by the time the start actually came, more than a little nervous. There were a lot of things that did not go well with the race – I got sick a few days before and didn’t sleep much the night before due to congestion, I got a little freaked out by the size of the crowd (I knew it was the world’s largest half-marathon but I wasn’t prepared for what it would feel like to be in that large of a field), I wasn’t as well trained as I wanted to be, and my time really sucked. But, in spite of that, I came away feeling mostly good about the race. I found myself all along the course noting things and thinking “I love that – I want to remember that!” I was actively looking for the positives, determined not to forget them, and making the effort to not let the negative dominate my memories. At the end of the day, I posted a list of the awesome, great, and not-so-awesome things from the race to my Facebook and I’m happy to say there were more in the first two categories than in the third. The race itself may not have gone the way I wanted, but the overall experience was valuable not just for the things in my awesome list but for the way I was able to change my perspective and see more of the positives. One of the awesome: I got to meet Meb Keflezighi at the expo and get his autograph! He ran the race, starting last so he could run with everyone! I am working hard now to use this skill again. Over Memorial Day weekend my older dog, Maggie, started having trouble with her back legs. Trips to an emergency vet clinic followed by a longer road-trip to the Veterinary Teaching Hospital at Purdue University ensued. Maggie’s been diagnosed with IVDD. There’s a swelling in one of the discs in her spine and it was delaying nerve signals reaching her back legs. Her back feet will “knuckle” and sometimes one back leg will collapse. She looks like she’s stumbling around drunk. If the swelling continues she could wind up with nerve damage and a ruptured disc, which would require surgery. The treatment at this time is anti-inflammatory and pain meds for two weeks and strict crate rest for the next 6-8 weeks. Strict rest means she is in the crate 24-7, except for when she’s being carried out to the yard to do her business (which is done while she’s on a 6 foot leash to keep her from walking too much or dashing after something). Making matters more complicated is the fact that Maggie is high-strung and suffers from anxiety. We are very concerned about how we can manage to keep her calm in the crate for that long. Fortunately the neurologist at Purdue was able to consult with the behaviorist who’s seen Maggie before and together work on a medical plan to help us and so far she’s doing well with being confined. Maggie, giving me the look while I eat my dinner. I’d originally scheduled to take the week of Memorial Day off work to do some yard work with my husband (we always take that week off and have what we call Mulchapalooza). We cancelled our mulch order and, while hubs stayed home with Maggie, I went back to work. I applied for Personal Leave and did triage on my job duties. I did some crash training on those duties which would have to be handled while I was on leave, taking care of Maggie. Now I have seven weeks of being home with my dogs, trying to make sure Maggie stays calm and heals while trying not to stress out about having no income from my job while still having all of our bills to pay. My husband got a furniture mover so Maggie’s crate is on wheels, making it easier to move about the house. I’m going back to what I did in the Mini and trying to see the positive in the next seven weeks. I get to be a stay-at-home dog momma. My introvert-half will be happy for the time alone. If I can only convince myself to stop worrying about it, I don’t have the stress of my job hanging over me. I should have time to do more writing, and to help more with Midwest Writers Workshop. We won’t be eating out but I do enjoy cooking – it will be fun to try some new recipes. I’ve always wanted to keep my house cleaner but never felt I had the time – now I will. Having little financial wiggle room will force my husband and I to do a better job sticking to a budget. It only takes 30 days to build a new habit, and we have the next 7 weeks to create some new ones which will serve us well even after I return to work. Most important of all, I am doing what Maggie needs and if all goes well, she will make a complete recovery without requiring surgery. These are the things I need to focus on over the next seven weeks. The princess, snoozing. She’s worth every bit of stress and struggle we may have! One of the two deerstalkers that my mother made for me, creating her own pattern. I have been known to wear this. In public. This book is close to pulling me back into that rabbit hole. I was an avid Sherlockian when I entered college, thanks to a friend I made my senior year of high school. I loved to play “the Great Game” (Holmes and Watson were real, Conan Doyle was just a literary agent, and all these stories really happened). I’d hole up on the third floor of the University library with a copy of Baker Street Byways or The Private Life of Sherlock Holmes and read them between classes. I discovered I could get copies of articles from the Baker Street Journal via inter-library loan and amassed quite a collection of them (at one point they had to cut me off because if I’d received any more articles that calendar year, I’d be violating copyright law; we worked around this by requesting the entire bound journal so I could make my own copies). Reading this book brought all that fun back for me – pouring over footnotes in Baring-Gould’s The Annotated Sherlock Holmes, driving off to Indianapolis and a Sherlock Holmes Symposium with that friend from high school, and making my own attempts at pastiche. We called this “the tome.” One of my two copies (yes, I have two copies of the same book) is on display in my house. The Great Game is only one part of the phenomenon that is Sherlock Holmes, and Dundas tries to explore them all. We begin with the beginning – Arthur Conan Doyle. Dundas traces his early life, at least so far as it might have influenced Holmes’s creation (this isn’t a biography of ACD). We get more details as they coincide with the publication of the various novels and stories in the Canon, and Dundas draws connections between real-world events surrounding Conan Doyle and the stories he wrote. When you play the game, you mostly ignore Conan Doyle. He’s just the literary agent, after all. But Dundas looks at Conan Doyle the story-teller, and he gave me a new appreciation for ACD. Conan Doyle was a master short-story writer. He had the formula down pat. And yet, his writings aren’t entirely formulaic. Holmes and Watson were useful characters who found themselves in a variety of stories. Action-adventure, spy thrillers, Gothic horror, and even something like a Western (as Dundas puts it, “the Sherlock Holmes Canon is a Whole Earth Catalog of storytelling strategies.”). Throughout it all, Conan Doyle creates a portrait of a lasting friendship. There cannot be a Holmes without Watson. Reading about Conan Doyle and the chronology of his writing of the Holmes stories made me realize I have never read them in publication order. My text has always been Baring-Gould’s text, which puts them in “chronological order,” or at least his version of it (if you put 5 Sherlockians together and asked them to put the stories in chronological order, you will get 5 different orders). I received a Persian slipper from my friend as a high school graduation present. Today it keeps company with a bust of Abraham Lincoln and an owl on my fireplace mantel. To date it still does not hold any tobacco. The book delves in to the various productions of Holmes, from the parodies published in newspapers contemporary with the stories coming out in The Strand to Gillette’s play and on-ward, lingering with Basil Rathbone and Nigel Bruce, skimming over Jeremy Brett (more really could be said about Brett’s performance and Granada’s production), and finally moving to Sherlock and Elementary. He takes a stab at discussing fanfiction (and treats it pretty fairly) and spends a satisfying amount of time giving the history of the Baker Street Irregulars and the writings about the writings. My Sherlockian bookcase, which includes different editions of the stories as well as some neo-Sherlock. Sayers and Stout both played “the Great Game” so it’s fitting they are there. Allingham sort of snuck in but I haven’t the heart to banish her. Dundas’s stated purpose was to answer some questions about Sherlock Holmes and the way he has continued for 130 some years in various forms. I found myself nodding along to his conclusions. There is Holmes himself, this man we know so much and so little about. Devotees can tell you many characteristics of the Great Detective, and yet his past remains a mystery. Who was he before he took on those first investigations (“The Gloria Scott” and “The Musgrave Ritual”)? What was his family life like? Where did he grow up? Where did he go to University? In the stories we learn very little beyond the fact that he has an older, even smarter, brother (Mycroft). Then there is Watson, the heart and soul of the business. Holmes is the genius detective, intriguing to be sure, but it is Watson that the reader identifies with. He is necessary to make the whole thing work (and if you doubt that, just look at the two stories ACD did with Holmes as narrator, and how they don’t work). At times Holmes is a calculating machine, but Watson remains reliably human. The Canon is a lasting portrait of their friendship. And finally, there is the sense that when we read Conan Doyle’s stories, we are getting a glimpse of a fully fleshed out world. I’ve likened it to peeking through a keyhole. You know there’s more to the room, things out of your line of sight – you can’t see them but you know they’re there. This sense of these stories being part of a larger world is intriguing (and gives rise to the Great Game, to pastiche, and opens the door for a multitude of interpretations of the characters). As Dundas puts it, “Conan Doyle didn’t mean to, but he salted his Sherlockian work with storytelling prompts. Watson repeatedly whispers ‘Go’ into the imaginative reader’s ear. And so, from almost the very beginning, other people have felt compelled to make up their own Sherlock Holmes stories.” People have done that in many ways, from finding “problems” in the original stories to analyze to writing pastiche to creating fanfiction to writing plays, radio dramas, movies, and tv shows based on the characters. If you love these characters, you can’t resist. You slip into that rabbit hole and off you go. It’s great fun, even if it would drive Arthur Conan Doyle mad. That fun is beckoning to me once more, but before I go back to the game, I think I’ll read the stories over in publication order. This book pulled me and didn’t let me go, much like mud in the swamp at the heart of the story. Sterling Saucier (pronounced SO-shur) was a great character. I felt her worries, her sense of urgency, her confusion as she tried to hold on to the memory of her brother and deal with a whole new set of memories, of a sister, which shouldn’t have been in her mind. She struggles against feelings for this sister, all while knowing that she shouldn’t have these memories of her. Sterling’s mission seems clear – get her brother back from the swamp, set things right again. Of course, it’s not as simple as all that. All magic comes with a price, and the magic of the Shine is no exception. Sterling has to find a way to get Phin back without losing herself, or anyone else, to the Shine. She has to deal with a town that denies the existence of the Shine, that fears the swamp and fences it away without ever daring to talk about or even think about why. There’s power in memory, power in fear, and power in where things (and people) are from. Sterling has to figure out how to work with all of that in her efforts to save her brother, and the one thing she can’t evade is the cost of the Shine. Sterling has a cast of other great characters around her. There’s Candy, her best friend and the undeniable leader of the group; there’s Heath, who understands what she’s dealing with; and though he isn’t there, her memories of Phin make feel her attachment to him. Even Lenora May turns out to be more complicated than she seems at first. The only character who really falls flat is Abigail. We’re told she’s black and Lesbian, but we don’t get any real sense of her a person. It feels like she’s there to check some box and that’s it. All in all this was a great read and I look forward to meeting the author at Midwest Writers Workshop later this year! I have enjoyed various versions of The Count of Monte Cristo since I was in high school. It began, not with Dumas’s novel, but with an old movie version starring Richard Chamberlain. It was part of a double-feature one Friday night on TNT or TBS. My parents remembered it and recorded it (along with another favorite, The Scarlet Pimpernel). My father liked the sword-play and that is most of what I remember about Chamberlain’s version. In college the University theater did a production of the story, adapted by one of the faculty. The student performers were joined by one professional actor, brought in to play Edmond. I went with a friend and we both fell for the actor at once. Going back stage to meet him was a thrill. I hadn’t thought of the story for some time, until I came across the 2002 movie version. The cast list alone made me gape: Jim Caviezel, Guy Pearce, Richard Harris, James Frain, Luis Guzman, and Herny Cavill (with such a baby face you’ll hardly recognize him). How was this not a run-away hit? Somehow it wasn’t, but it is most definitely my favorite adaptation of the tale. You probably know the story. Edmond Dantes is betrayed by his best friend, Fernand Mondego. He goes to prison for 13 years. His fiancee is told that he’s dead. His father hangs himself. His boss winds up swindled out of his business. Edmond, in the meantime, suffers beatings and near starvation. He also meets a fellow prisoner who, as they attempt to tunnel to freedom, teaches him to read and write, mathematics, economics, philosophy, and fighting. With his dying breath the man tells him where a treasure is. He urges him to use it for good, but Edmond says no, he will use it for his revenge. In Dumas’s novel, the revenge plot becomes convoluted. Here it is simplified and straight forward. It is my favorite part of the tale. Edmond plays his enemies like violins, using their own greed and lust for power against them. He sets the traps but they enter them willingly. They bring about their own destruction. There is justice in what befalls them. Everything goes perfectly, save one thing. Mercedes, the woman Edmond was to marry, is not so easy to deal with. He wants to hate her. She married his best friend, the chief architect of all his suffering, and yet he cannot. His henchman urges him to take his treasure and Mercedes and to leave – to give up his revenge and go find happiness. Edmond refuses, at least at first. Here again we deviated from Dumas. Mercedes doesn’t slink away to live in a convent. She confronts Edmond, tells her side of the story, and he realizes that it will not enough to destroy the men who hurt him. He wants the chance at happiness with her. In Dumas’s tale Edmond has a single-minded quest for revenge. In this film version, the story becomes about more than just pursuing revenge. Edmond lost his way in the prison, but in the end he is able to find it again. He started out on a quest for vengeance but in the end he finds a chance for redemption and he chooses that. Of course, Fernand being the petty man that he is, he can’t let Edmond go and there must be a final confrontation (with swords, naturally, because Dumas did write the original tale). It’s a fun tale, with great visual spectacle, an amazing cast, and a highly satisfying conclusion. If you haven’t seen this version, I highly recommend it. As I said, it is my favorite. Besides, look at that cast! As I got closer and closer to the end of this book, I became more and more torn. I wanted to know what was going to happen next, but at the same time I didn’t want the book to end. I loved the world Zahn created, loved the characters of Jordan and Ixil (and Pix and Pax) and I didn’t want to leave them. I went to Zahn’s Goodreads page, hoping he had written more with these guys, but he hasn’t, so I knew when I reached the end, that would be it (except for re-reads). Zahn plunks you down in a wholly-crafted world of space travel, bars on far-off planets with disreputable mixes of humans and aliens, space craft hauling cargo, and a mix of humans and aliens crewing them. It’s a familiar world – lots of sci-fi novels take place in similar ones – but it’s great atmosphere. We learn more about the politics of this world as the story goes on, just as we should (those play a key role in the action). We don’t get bogged down in the science part – Zahn doesn’t lose sight that this is fiction. This is a good old fashioned space opera and thus it is our characters who matter most. Zahn creates good ones, ones you like and enjoy rooting for (or against). Jordan McKell might remind you a bit of Han Solo. He’s a spaceship pilot, former military now turned smuggler, but there’s more to him than that. Ixil is his partner, an Iguana-faced alien with two symbiotic critters, similar to ferrets, that perch on his shoulders when they aren’t being sent off to scout or stand guard (or when they haven’t spotted some good food nearby). Ixil and Jordan have each others’ backs, and that is good because they’re part of a crew of strangers hauling, taking a bizarre spacecraft from a far-flung world to Earth. Their boss failed to show for lift-off, their cargo hold is sealed so they don’t know what they’re hauling, and at their first maintenance stop their mechanic is killed in what may or may not have been an accident. Add to the mix a criminal underworld boss, another mysterious man of power, and a race of aliens who control most shipping who are showing a great deal of interest in the ship, and it’s going to be all Jordan and Ixil can manage to fulfill their contract to deliver the Icarus to Earth while staying alive. It makes for a great page-turner and a fun read!